Home / employee advocacy / Employee Advocacy: A brilliant opportunity or yet another channel to tame? A version of this article first appeared in the CIPR Influence magazine February 2017 edition. Employee advocacy is something clients ask me about on an almost weekly basis. How do you do it, and do it well without it becoming seen another campaign from the PR or comms teams. Done well, it can not only improve the standing in the company in the eyes of potential employees (delighting the HR team), it can also delight the PR team who are always looking for new ways to place well written content amongst new, influential audiences. The downside of a fragmented and ill-conceived employee advocacy program is that it is simply seen as another arm of the PR team and employees quickly develop “advocacy fatigue”, responding to yet another request to “please retweet our latest news”. Just as a few years ago, clients were asking me to explain the ROI for developing a capability to listen to social media (let alone engage), they are now wanting to develop employee advocacy programs as they see the value in having employees distribute company content. For those in the company that are experienced with social media, and perhaps already have an audience and following of several thousand people, the nervous question remains, should I just retweet what the press office has sent out? A properly developed employee advocacy program must form part of an integrated communications strategy which involves all channels, not just social. Best practice and my personal experience suggests that your employee advocates can be effective across all of your channels. While it may be that you put the MD or CEO forward for TV appearances and keynotes, properly trained employees lower down the pecking order may have an even greater impact than first thought. What about my personal brand? Employees experienced with social media tactics already know the value and potential of their personal brand, and the smart ones will seek to protect it, while others seemingly don’t care. I know of one senior manager of a large company that literally has set up some 3rd party software to tweet anything and seemingly everything published by their company hundreds of time a day. It is clear that this person has no real idea of the damage it is doing to their personal brand, as they will be seen simply as a PR robot. Someone who does have an understanding of their own personal brand will be very hesitant to simply retweet or repost the company line. They should think like a blogger (if not one already) and understand the insight they can bring to the discussion as they are uniquely placed to comment on the latest piece of news. Smart PR teams are already adding their own advocates to their PR lists, and send their hand-picked people embargoed news, with the company narrative, and exclusive assets that they can use to perfectly frame the story, in their own voice, in the language of their community. Clearly in my capacity as company employee I will be expected to only post my own positive stories about the company. By not simply copying the company line, and instead adding my own insights and point of view (with all the usual disclaimers), I am much more likely to have my content distributed among my community and my unique insights reflected upon as someone closely connected to the subject. Just as PR teams are now treating bloggers and influencers in a similar way to the press by getting to know them personally, and inviting them to press briefings and product launches, they should start to identify those in their own company that could play the role of ambassadors from the inside. 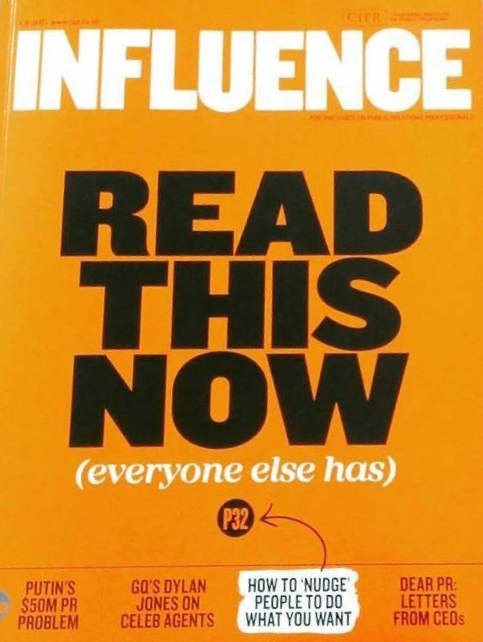 In previous editions of Influence, the issue of paying influencers was covered. Before IBM I was the CEO of Influencer platform Kred, and as such I have a unique view of the whole psychology of social media “influencers” (yes the quotes are deliberate). Having moved from a small start-up to a large multinational, the “lightbulb” moment for me was when I realised we already had thousands of influencers in the company and we were already paying them – they’re called employees! Once you have recrafted your communication strategy to include employee advocates, you then need a way to get their messages out beyond just the existing channels such as Facebook, LinkedIn and Twitter. You need to have some owned media that you can place content created by your advocates (and paid and organic influencers) alongside your own content and that from trusted industry sources. What’s the ROI of employee advocates? To support the growth of any advocacy program you also need a way of measuring success. Without measurement, it will be harder to convince those higher up of the unique value this new channel can bring. While it would be impossible to connect all of the social media accounts to your company (to understand the metrics of the interactions), the next best method is to have your own tool that collects relevant and approved content that can be shared by your employees in a frictionless way. If they use your platform to share this content (and even add their own angle), then you will be able to measure the impact of this. For those employees more comfortable using their own brand and channels, co-coordinating with them a way to measure link clicks, website stats and other metrics such as shares and retweets can evolve into a great collaboration with the PR teams. There are already a number of employee advocate platforms, and one vendor I spoke to suggested upwards of 200 exist. This reminds me of the social media listening market circa 2009 when there were as many platforms dedicated to listening and engaging on social media. Clearly many will perform similar functions, and we can expect consolidation over time. What it does point to though is the demand for such platforms, and buyers need to ensure they aren’t just buying another stand-alone tool. Integration into internal systems over time is key for success from any digital or social tool. Platforms I have come across include Dynamic Signal, Smarp, Passle, Trapit, and LinkedIn’s own “Elevate”. All of these platforms will have similar features, and I am sure many PR teams as they read this article are pouring over excel spreadsheets trying to figure out the features vs costs of one over the other. There are great examples of these already such as Visa Vision and IBM’s own Think Marketing. Any discussion about employee advocacy would not be complete without a discussion on “what next?”. When I have as many of my employees as possible engaging in an authentic and helpful way, what can I do beyond this? In my view, the next phase and the “gold standard” of advocacy is eminence. Eminence is of course bestowed on you as you can’t “become eminent” on your own. A good example of eminent people are those awarded a Nobel Peace Prize. They are seen by the prize committee, their peers and the world as truly eminent in their field. Eminence is not just about having a good command of social media, a personal brand and tens of thousands of twitter followers. It is much deeper than that. Personal Character – are they humble in their pursuit of knowledge about there area of expertise and do they encourage and mentor others? Body of Work – do they have a large amount of published thought leadership on their specific subject, peer reviewed and respected? Practical application – has their thought leadership been put into practice and does it work? For Michael Faraday to become eminent, his study of electromagnetism had to be practical and it formed the basis for electricity. To become eminent, you need to move beyond just words. Time – it takes time and personal investment to become eminent, and as such you need to treat your eminent people with a different approach than your employee advocates. One of my clients recently said to me “We have so many smart people in this company but no-one knows about them.” A properly developed and executed eminence program can change that, leading to a stronger sales pipeline, increased sales and more favourable brand awareness. While the population of eminent people in your firm may be under 1 percent of your total workforce, their impact when promoted via all channels including social, in the press and on stage could be enormous. Why would you want the 5th most eminent person on a topic to work on your project when you can have the most eminent person? Whether you are considering an employee advocacy program or looking at eminence, it has to be planned and executed as a part of an integrated communications strategy for maximum impact and longevity.